If the court of public opinion has an impact on a jury's decisions, Texas Governor Rick Perry may have a chance of beating his indictments. While poorly informed Democrats like Obama advisor David Axelrod call the indictments "sketchy," Perry's advisors have him concentrating on defending his constitutional authority to exercise the line item budget veto. Except that's not what this case is about. Perry is accused of using his veto authority to coerce a publicly elected official into leaving office. And when the veto threat, and later the actual exercise of the veto didn't work, he may have tried a bit of bribery, which is why he is facing criminal charges. Not because he exercised his constitutional veto authority. Some of the media appear to have adopted the Perry narrative that he wanted to get rid of an irresponsible Travis County District Attorney Rosemary Lehmberg because she had been arrested for driving under the influence of alcohol. Lehmberg, whose blood alcohol level was about three times above legal limits, was recorded on video as drunk and belligerent during booking. Perry is arguing he eliminated the $7.5 million dollar budget that Lehmberg managed for the Public Integrity Unit (PIU) because she was no longer responsible enough to run the operation. But the governor probably had another motive. The PIU had been investigating the Cancer Research and Prevention Institute (CPRIT), a $3 billion dollar taxpayer funded project that awarded research and investment grants to startups targeting cancer cures. The entire scientific review team, including Nobel Laureate scientists, resigned because they said millions were handed out through political favoritism. Investigations by Texas newspapers indicated much of the money was ending up in projects proposed by campaign donors and supporters of Governor Perry. In fact, one of the executives of CPRIT was indicted in the PIU investigation for awarding an $11 million dollar grant to a company without the proposal undergoing any type of review. Perry might have been the next target. The same cronyism appeared to be at work in two other large taxpayer accounts called the Emerging Technology Fund (ETF), and the Texas Enterprise Fund, (TEF), which were supposed to be used to help technology startups and assist companies wanting to move to Texas. In total, the governor and his appointees had purview over about $19 billion and where they wanted it invested. Why not make sure your contributors get some of that sweetness? If Perry were able to get Lehmberg to resign, he'd have the authority to appoint her replacement. We can assume that would have been a Republican, and that any investigations might have stuttered to a halt. The DA, however, refused, and began to field threats from the governor's office that the PIU budget was to be zeroed out via line item veto. But the exercise of the veto is not what got Perry indicted. First, he used the veto to threaten a public officeholder. This is abuse of the power of his office. Presidents and governors frequently use the possibility of vetoes to change the course of legislation. But that is considerably different than trying to force an elected officeholder to resign. What Perry did, if true, can be politely called blackmail, and, when he sent emissaries to urge Lehmberg to quit even after his veto, he may have indulged in bribery. According to sources close to the grand jury, Perry dispatched two of his staffers and one high-profile Democrat to tell Lehmberg if she left her office the governor would reinstate the PIU budget. One report indicates there may have been a quid pro quo of a new, more lucrative job for the DA, which is why this case has nothing to do with his right to use the veto. But that's where Perry will focus his public defense. That all makes it hard to sell the partisan attack narrative that reporters are spreading for Perry. The idea that he was concerned about Lehmberg's drunk driving is also fatuous nonsense. Two other Texas DAs were arrested for DUI during Perry's tenure in office and he spoke not a discouraging word about their indiscretions. Kaufman County D.A. Rick Harrison drove the wrong way into traffic and was found guilty of drunk driving in 2009 and in 2003 Terry McEachern, DA of Swisher County, was convicted of a DUI. Perry said nothing. It's probably only coincidental that both of those individuals were Republicans and did not oversee an investigative unit responsible for keeping elected officials honest in the capitol. The indictments, however, have not left the Texas governor chastened. During his six-minute news conference after they were handed down, he threatened retaliation for the people involved in getting him into this mess, which is probably another form of official abuse he has promised to deliver to his fellow Texans. His central complaint was that the legal and grand jury investigative process was being used to settle political differences and that wasn't something we did in America, which is a startling irony for anyone who knows how Rick Perry first won statewide public office in Texas. When Perry ran for Texas agriculture commissioner in 1990, he benefited from a federal investigation of his opponent's office, which had been facilitated by his campaign manager Karl Rove. Rove worked with an FBI agent to investigate Democrat Jim Hightower and two of his senior staffers at a time when Perry was challenging Hightower for the agriculture commissioner's job. The FBI, in fact, served search warrants at Hightower's state office on the day he was out of town announcing his reelection plans. Perry had been a Democrat and Rove had convinced him to change parties. Rove ran Perry's winning campaign while also constantly leaking information on the federal investigation to reporters. Hightower escaped indictment but the two senior administrators of his office were convicted of raising campaign money for the Democrat during after hours while traveling on state business. One long-time Austin political operative said that if that were a crime, it was "something that only happened about 1000 times a day in Texas." 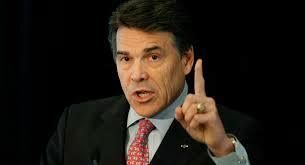 Consequently, Perry is demonstrably incorrect that Texans don't use the legal system to settle political scores. Instead, we often turn it into a form of tragicomedy. The PIU has prosecuted seventeen officeholders since it was created; thirteen were Democrats. And it will be no minor irony that Perry, who came into statewide office as the result of a grand jury investigation, might just end his career as an outcome of the same process.